The mission of Open Source Ecology (OSE) is to create the open source economy. An open source, libre economy is an efficient economy which increases innovation by open collaboration. 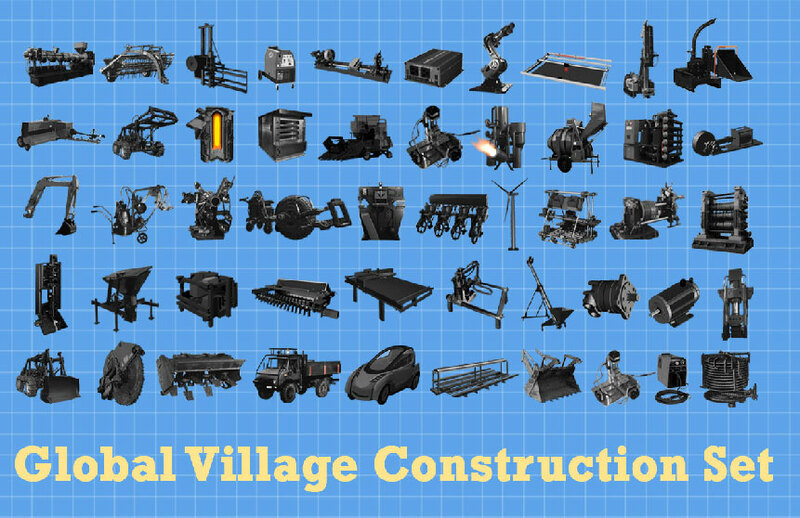 To get there, OSE is currently developing a set of open source blueprints for the Global Village Construction Set (GVCS) – a set of the 50 most important machines that it takes for modern life to exist – everything from a tractor, to an oven, to a circuit maker. In the process of creating the GVCS, OSE intends to develop a modular, scalable platform for documenting and developing open source, libre hardware – including blueprints for both physical artifacts and for related open enterprises. The current practical implementation of the GVCS is a life size LEGO set of powerful, self-replicating production tools for distributed production. The Set includes fabrication and automated machines that make other machines. Through the GVCS, OSE intends to build not individual machines – but machine construction systems that can be used to build any machine whatsoever. Because new machines can be built from existing machines, the GVCS is intended to be a kernel for building infrastructures of modern civilization.